Sealed copy of the 4th album from Australian psych garage lunatics! Only 500 pressed on splatter coloured vinyl! 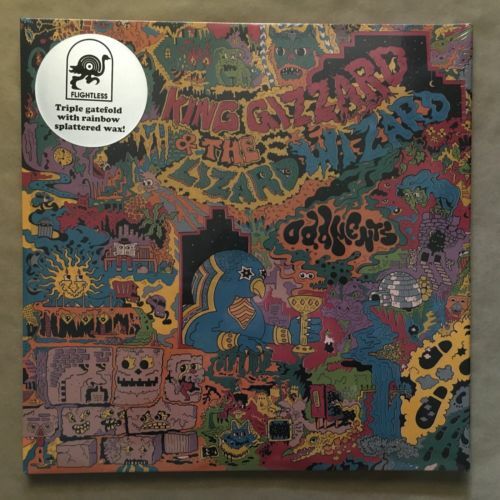 Regretfully selling my King Gizzard and Murlocs vinyl collection. I have owned them since release and all have been played less the 5 or 6 times each, some only 2 or 3. My loss is your gain. Check my other listings! All will be sent by registered post in Australia, or pickup OK in Coffs Harbour. NM - very clean record with one or two signs of use if any, plays without fault, labels are clean, sleeve will be very clean and have only 1 or 2 blemishes. VG+ - in very nice condition with a handful of light marks that don't affect play, labels have small writing or surface marks or spindle trails, sleeve has some light marks or creases, no writing, tears or splits. VG - record will have noticeable signs if use such as sleeve scuffs or light scratches, it will play through fine with some light surface noise in quieter places or the odd tick or pop, labels will have writing and/or surface marks or tears, sleeves will have creasing, surface marks and maybe a split or tear. G - record will have numerous marks, some feelable, will play with more noise, labels will have tears or marks, sleeve will have several faults including writing, tears and creasing. F - record will show many marks and play with constant noise or have a skip, labels will have many marks/writing, sleeve will have many faults including splits, tears, writing and creasing. I play grade unsealed records by playing parts of each song and where there are marks that I think may cause noise. I'll describe these so there will be no surprises, but if you think I've made an error contact me before leaving feedback so we can resolve any issues. All records are carefully cleaned and supplied with inner and outer sleeves. I send 7" records securely packed in cardboard and 12" records in new mailer boxes with cardboard stiffeners, the record placed outside the sleeve to prevent seam splits in transit. Final sales amounts over $50 will be sent via registered post, adding $3 to postage cost. 12" by registered international post only. Price depends on country, but maximum of $30. Multiple 12" cost to be quoted before shipping. Happy to answer any questions about items listed. Thanks for looking and happy digging!